Climbing Plants are valuable long term investments for your outdoor space to enable you to enjoy your vertical planting areas. They will provide you with privacy from your neighbours and unsightly objects, wonderful scent, flower and foliage affects and a haven for wildlife so they also feel at home in your garden. Don't expect miracles from your vine from the moment you plant it in your garden. 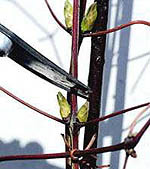 Any flowers that you do have on your vine will NOT have the colour intensity, size or vigour and will generally flower out of its specified flowering period - (for example your red vine starts off wine/purple and you think you have the wrong plant or a double flower you are hoping to see starts off as a smaller single - the plant just needs time to establish). Soil condition will also affect the flower colour and foliage quality, the best type being a good quality loam which retains moisture but does not waterlog (john Innes no 3 is ideal if you need to improve or condition what you have). So for the first year take time to establish its root system. You are begining a process that if you have chosen well and purchased from a reputable grower then you will be rewarded well for the effort. Now we know the most important part of your plant is the root system and size is not important. A frequent report back is from customers who have spent �plus on a plant from the local garden centre and when trying to plant the root system falls apart and the plant never gets going. 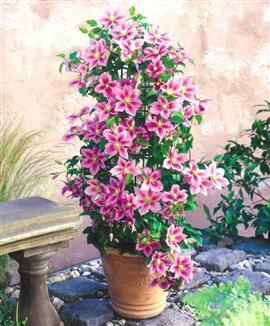 Our standard size climbers are grown in 9cm wide and deep pots and despatched with the pot to protect the root system in transit. 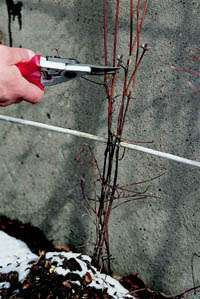 They are 2 yr old vines that we prune twice to encourage a stronger vine. We use a compost additive called 'Exemptor' which ensures that the root system is strong and healthy and will establish well. 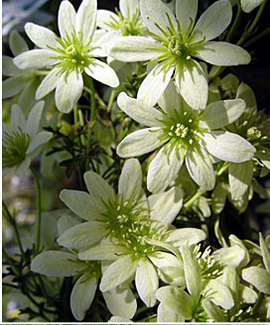 Growers have standardised the pruning of all clematis into three groups and just make sure you know before you buy which group it belongs to and it will reward you well. 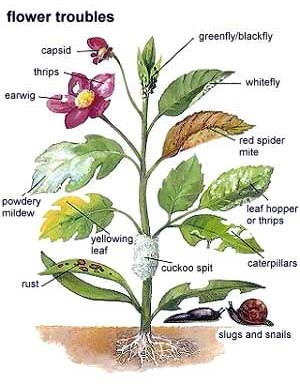 Common garden pests and disease that are easily treatable.